The world appears to be spinning ever faster into the future. Time rushes by and life becomes ever more hectic. A life among antiques, however, can slow things down, making us stop and contemplate the beauty of old workmanship and artistry and its history. At The Marndadee Heritage Chiang Mai, 80 percent of the furnishings and décor are antiques, distinguishing every room with an individual touch. A cupboard once owned by a British resident of Burma, a bed of British origin that came from India and a sofa from Germany are just a few of the examples of the eclectic collection of the resort’s furniture. The name concept of "Marndadee" stems from the owners' love for their mothers. The root word, "Marnda," means mom, and "dee" means good in Thai. Together, "Marnda-dee" translates to a warm and nurturing mother. Here, we extend our love of "marnda" to the mother earth. We believe in living a balanced life in harmony with our mother nature. We aspire to provide you a safe and secure space to connect back with the mother earth as well as to find a way back to yourself. 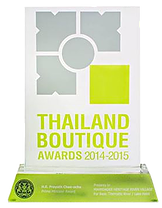 The one ultimate pride and success of MARNDADEE Heritage River Village is the winner of Thailand Boutique Award of 2014 – 2015 in the 1st year of our operation and 2016-2017 consecutively . We do attend to maintaining this first step of our success and will always work hard for our important clients forever with the warm welcoming of good mother. "Eden-like location perched above river. Stepping into this hotel after a long day of traveling in the north is magical. A pool is perched above the bend of a quiet river where locals fish. We were greeted with a cooling drink and then offered a free cocktail later while we watched our kids swim in the pool. The grounds are lovely. Lanterns light the way at night, the rooms are also very pleasant, and the food was very good." "Absolutely stunning! We stayed at Marndadee with a toddler and a baby for 5 days. The hotel exceeded our expectations. Amazing garden with gorgeous sculptures, little ponds and fishes to keep our very lively toddler entertained. Impeccable service - the team simply couldn't have been more helpful and pleasant when dealing with our every request. Great facilities with a lovely pool, a little gym and convenient shuttle service to the centre (and a quick laundry service - very important with young children)." "Serene riverside resort away from the city. 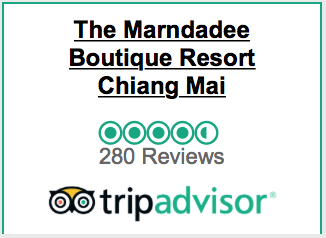 Marndadee is a quiet, relaxing resort located 30 minutes drive from the old town. It's been decorated impeccably with luxurious sculptures and beautifully manicured grounds. I felt like a millionaire staying at a place like this." "This property is world class. 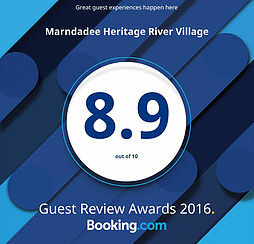 Usually hotel pictures aren't the real thing, but at Marndadee, it is truly as the pictures show. Rice paddies all around, the décor is well-thought out (even in the workout room). I would like to come back here about 10 more times to stay in each of the different rice barn villas. The food was really good, lots of good options, breakfast was the same with good western and Thai choices. The service is as you expect in Thailand, first rate. The mattress is not a "heavenly bed," but it is better than most of the ones you encounter in Thailand."